I only watch films, comedies and documentaries on television, but didn’t think I’d ever watch the former about football. Well, I have been nicely surprised. For the past two weeks, I’ve been watching Being: Liverpool on Channel 5. 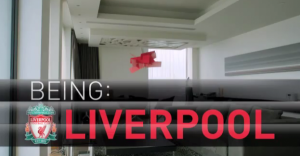 It’s a fly on the wall documentary series, with unprecedented camera access to Liverpool Football Club. Not only have I found myself interested in football for the first time, but also have a little thing for Channel 5 of late. It all started with Dallas 2012 which I know does not fall into either of the three genres I normally watch, but it is GREAT TV! A lot of folk slate Channel 5 for being the poor one of the original 5 UK terrestrial broadcasters, but watching it of late shows it can give the others a run for their money. This has been a… Being Liverpool, ‘View from the Bottom’.